Save up to 33% off. Applies when you order by 4PM CST. For most women, hair is a key asset. Hair sisters is the go-to recourse for synthetic and human hair weaves, wigs, and braids. Don’t split your wig over high prices – save when you spend with Hair Sisters coupon codes. Can't find what you're looking for from Hair Sisters? Consider checking out similar professional salon products from Sally Beauty. You'll save a bundle on all of your beauty needs with our Sally Beauty coupon codes. Hair Sisters is your one stop shop for all ethnic beauty supplies. Choose from quality synthetic wigs or 100% human hair wigs. There is also beautiful weaves and hairpieces available. Be beautiful for less. Use a Hair Sisters coupon code to save money with each purchase. Below are instructions on how to use and apply a Hair Sisters coupon code. After locating the coupon or deal you want to use to purchase Hair Sisters items, click the corresponding "Get Deal" button on the Couponpal Website. A new window will pop open when you click on your button. 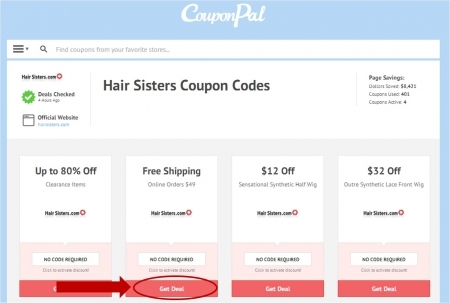 If Couponpal is providing you with a Hair Sisters coupon code, copy and paste from the pop up window. Keep this window open in case you need to come back to it later. If there is no Hair Sisters coupon code, you will skip this step. After you have clicked the Couponpal "Get Deal" button, your window will be redirected to hairsisters.com. You can now browse through the category of Hair Sisters items you want to purchase. For example, you can click on Hair Products, Natural Hair Care, General Hair Care, Skin Care, Nail Care, Cosmetic, Hair Tools, General Merchandise, Fashion Jewelry, Apparel & Accessories. When you find a Hair Sisters item you are interested in, click on its picture to take you to the product page. Continue to refine product search by using the next set of product categories on the screen. Click "Go To Cart" to continue with purchase. 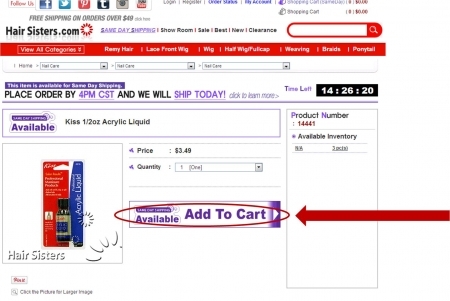 Confirm everything in your shopping cart is correct. Calculate your shipping cost by entering your zip code. Then click "Submit." Click "Proceed to Secure Checkout" to continue with purchase. If you are not a Hair Sisters, customer, click "Register" to open an account. Fill in your personal information, then click "Register." Enter your billing information, shipping information, and shipping method. Review your order, then submit your order by entering in your payment information. Click "Submit Your Order Now" to finalize purchase. Hair Sisters prides themselves on being the largest ethnic beauty shopping site in America. This is due to their incredible selection, great customer service, and a commitment to helping you make the best choices when it comes to your beauty. They carry only the finest and highest quality synthetic and 100% human hair wigs, weaves and hairpieces you’ll find anywhere. Name a hair product and they have it, and from all the top names. 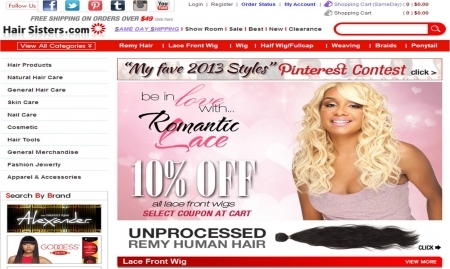 Remy Hair, Lace Front Wigs, Half Wigs & Fullcap. Weaving Hair, Braids, Ponytails, Fusion Hair, and more, whatever style or addition you’re looking for is yours for the choosing. There are 217 different styles to pick from in Ponytails alone, so yeah, you’re gonna find something that is just perfect for you. They also have everything you need to take care of that hair, from product to color, flat irons to dryers, and braiders to corn cutters. Whatever tools you need to make your look work, Hair Sisters has your back. And front and side, too. Besides things for your hair they also provide Skin Care, Nail Care, Cosmetics, Fragrances, and Fashion Jewelry. Plus, apparel wise, they carry stockings, shapewear, and shoes. So, from head to toe, they can have you looking good. When you hit up their site, make sure to check their “Clearance” section for some really sweet deals. Make your purchases using a Hair Sisters coupon code to save some cash and get ready to see every head in the room turn when you walk in. Even more than they already do.